Peter O’Neill scored an individual low gross of 66. Bob Kando scored a personal best with a 73. Jim Quinn played his first JT Classic recording a 78, another personal record after driving from his home in New Jersey the day earlier. The featured foursome for the day included Jim Tanner, Norm Lutz, Stan Abrams and Stan Baluik. Terrence O’Neill was introduced as the first Jim Tanner Scholar. Terry will be attending URI in the fall. Also receiving Burke Fund Scholarships were Michael S. Capineri, who just finished his freshman year at Boston College and Julia G. Spencer. Julia will be attending the Isenberg School of Management at UMass Amherst. 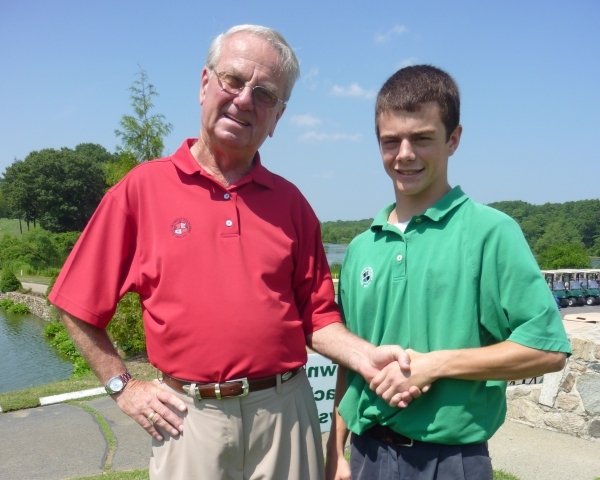 The three scholars work at Pawtucket Country Club. Special thanks to all our contributors that helped us raise $9,000 for the Jim Tanner Scholarship this year. Zlatomir Kircanski won the 50/50 chipping contest by 2 inches with a 65 yard chip over the pond to the putting green measuring 8 feet from the hole. Z-man beat Chris O’Neill in the finals winning $60. Congratulations Z! Shotgun start tomorrow morning June 6, 2010 at 8AM and 2PM. We have 17 foursomes in the morning and 24 foursomes in the afternoon. 164 players will compete in the 4th annual Jim Tanner Caddy Classic.